Artistic Leather Furniture features the highest quality Italian leather available on the market. These collections feature a 100% Solid Hardwood Kiln Dried Frame, 8-way Hand Tied Suspension, Pocketed Coil Seat Cushions Wrapped in Down Feathers, and Down Feather Filled Back Cushions. In addition to these features which add to the comfort and strength of the frame, Artistic Leathers purchases only the most select Top Grain Hides for a jaw-dropping appearance on every one of their models. Averaging 5 or more hides per sofa, Artistic Leather hand picks the least scarred and blemished hides in order to prevent heavy manufactured and stamped finishes like most companies. With leather, the more work that is done to a hide to remove these imperfections, the less supple, deep grained, and rare the hide becomes...and that is exactly what Artistic Leathers has perfected with these collections. Each available hide from Artistic Leathers is as natural as possible which enhances the supple natural grains and comfort. Feel free to request a sample of the leather and be amazed! These collections are available in a variety of top-grain Perfect Hide leathers and many custom options. 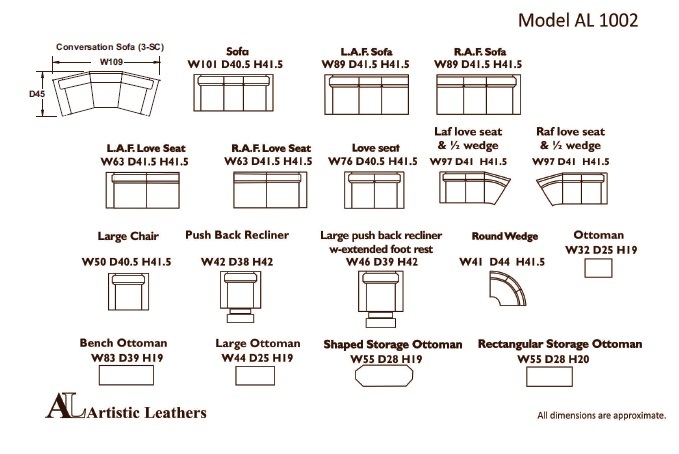 See below for information on each leather type. Email or Call for current promotional prices and shipping quotes! Accented with rustic nailheads and an elegant framed seat trim, the #1005 series is designed for high-end living room settings. Hand Picked 100% Top Grain Perfect Hide Leather encases the down feather seating and back cushions and individual pocked coils span the seat support for a premier seat pitch and luxurious support. This model is part of the Signature Collection and includes all of Artistic Leather's Premium Features including a 8 Way Hand-Tied Support Coil for extra longevity. The #1005 model can be done in several different two-tone combo hides and is also available in a smaller 93" sofa room group if 103" is too large. Choose from any of several Perfect Hide Top Grain options including Matte Finish, Semi Gloss Distressed, Rustic Wax-Coated Distressed Finishes, Hand Antiqued and Distressed, Protected or Two Toned Accent/Window Pane finishes. Sink into the luxurious down feather cushions and enjoy the modern rustic styling of the Artistic Leathers #1032 Collection. This set also features down feather wrapped back and seat cushions, as well as an 8 Way Hand-Tied Support System. Choose from any of several Perfect Hide Top Grain options including Matte Finish, Semi Gloss Distressed, Rustic Wax-Coated Distressed Finishes, Hand Antiqued and Distressed, Protected or Two Toned (Platform or Arm Accent) finishes. 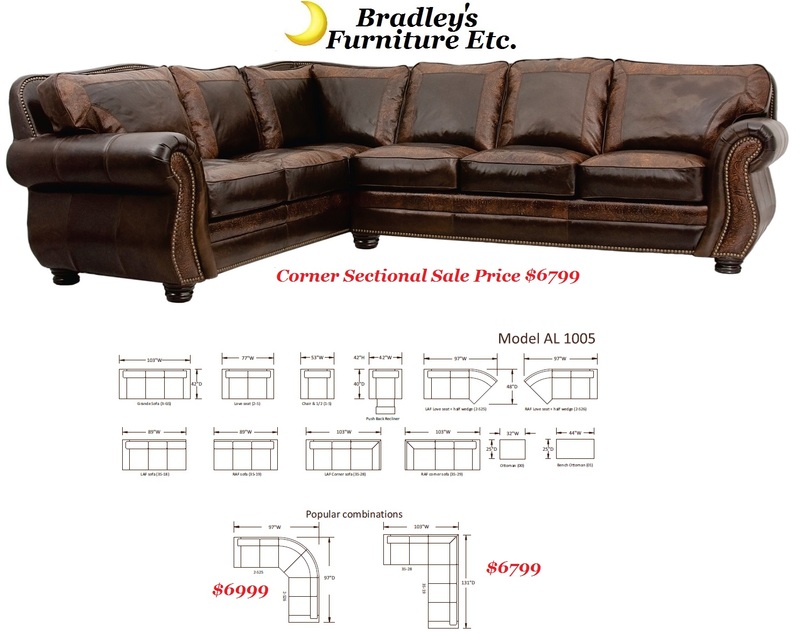 The Artistic Leathers #1033 Collection offers dramatic squared off arms with bold lines and extra deep seating. This set also features down feather wrapped back and seat cushions, as well as an 8 Way Hand-Tied Support System. Choose from any of several Perfect Hide Top Grain options including Matte Finish, Semi Gloss Distressed, Rustic Wax-Coated Distressed Finishes, Hand Antiqued and Distressed, Protected or Two Toned (Platform Accent) finishes. The Artistic Leathers #1022 Collection showcases traditional rolled arms and plush seating. This set also features down feather wrapped back and seat cushions, as well as an 8 Way Hand-Tied Support System. Choose from any of several Perfect Hide Top Grain options including Matte Finish, Semi Gloss Distressed, Rustic Wax-Coated Distressed Finishes, Hand Antiqued and Distressed, Protected or Two Toned (Platform or Arm Accent) finishes. The Artistic Leathers Tufted Back Collection showcases traditional rolled arms and plush seating along with an elegant hand tufted back design. This set also features down feather wrapped seat cushions and an 8 Way Hand-Tied Support System. Choose from any of several Perfect Hide Top Grain options including Matte Finish, Semi Gloss Distressed, Rustic Wax-Coated Distressed Finishes, Hand Antiqued and Distressed, Protected or Two Toned (Platform or Arm Accent) finishes. This set is available in a low back all leather or leather/fabric option, high back, or a conversational curved medium back#1042 seen below or a high back #1056 model top right. The new Artistic Leathers #1115 Collection showcases a unique angled/rolled arm and plush seating. This set also features down feather wrapped back and seat cushions, as well as individual pocked coils and an 8 Way Hand-Tied Support System. Choose from any of several Perfect Hide Top Grain options including Matte Finish, Semi Gloss Distressed, Rustic Wax-Coated Distressed Finishes, Hand Antiqued and Distressed, Protected or Two Toned (Platform or Arm Accent) finishes. The #1099 collections feature a modern squared arm with luxurious down feather wrapped seats and backs, individual Marshall pocketed coils embedded within the cushions, and the industry's strongest 8-Way Hand Tied wire support technology for long life. Choose from any of several Perfect Hide Top Grain options including Matte Finish, Semi Gloss Distressed, Rustic Wax-Coated Distressed Finishes, Hand Antiqued and Distressed, Protected or Two Toned (Platform or Arm Accent) finishes. The Artistic Leathers #1100 Collection showcases traditional rolled arms and plush seating. This set also features down feather wrapped back and seat cushions, as well as an 8 Way Hand-Tied Support System. Choose from any of several Perfect Hide Top Grain options including Matte Finish, Semi Gloss Distressed, Rustic Wax-Coated Distressed Finishes, Hand Antiqued and Distressed, Protected or Two Toned (Platform or Arm Accent) finishes. Also Available in a Sleeper Sectional, an alternate Square Corner, and Armless Chairs for any Length! The #1025 collection features tapered rolling arms with nailhead trimming, luxurious down feather wrapped seats and backs, individual Marshall pocketed coils embedded within the cushions, and the industry's strongest 8-Way Hand Tied wire support technology for long life. Glazed with a protective shield against spills and scratches, each Vintage Hand Antiqued Leather is designed for long life while featuring darkened edges for a one-of-a-kind prestigious look. Choose from any of several Perfect Hide Top Grain options including Matte Finish, Semi Gloss Distressed, Rustic Wax-Coated Distressed Finishes, Hand Antiqued and Distressed, Protected or Two Toned (Platform or Arm Accent) finishes. 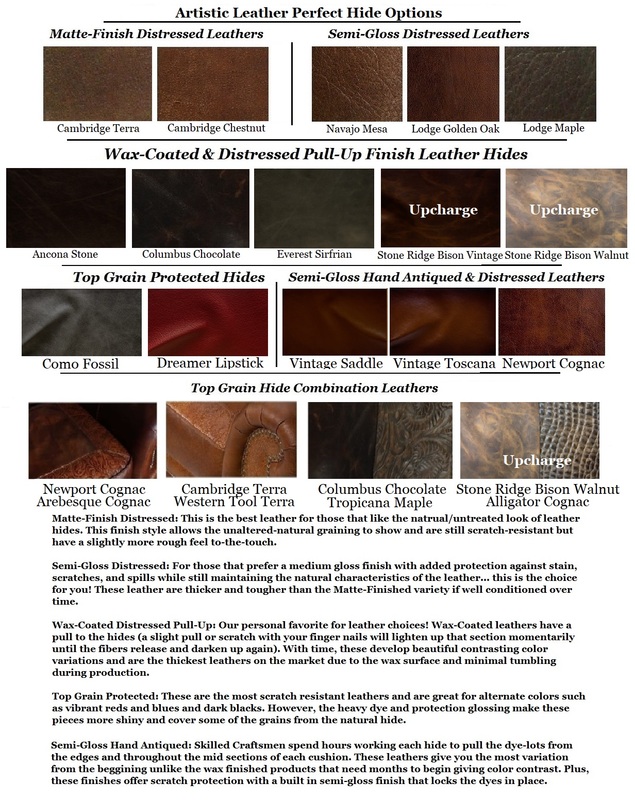 Leather Color Options - Contact us for a Free Sample!